To minimize empty seats, we are issuing more tickets than available seats. Reserving a ticket does not guarantee admission. Arrive early to claim your seat. 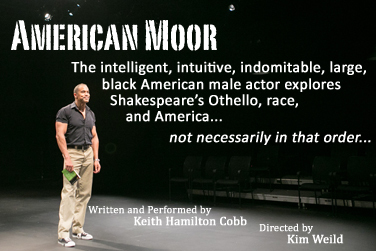 American Moor is a 90-minute solo play written and performed by Keith Hamilton Cobb, examining the experience and perspective of black men in America through the metaphor of William Shakespeare's character, Othello. American Moor is not an "angry black man play." Rather the diverse audiences that have experienced it echo the piece's awareness that we see only what we want to see of one another, and that we all long to be wholly noticed and wholly embraced. It is a play about race in America, but it is also about the American theatre, about actors and acting, and about the nature of unadulterated love. It is an often funny, often heartbreaking examination of the pall of privileged perspective that is ultimately so injurious to us all. Keith Hamilton Cobb is an actor who has spent the majority of his working life on stage and is readily recognized on the streets of New York for several unique character portrayals in television. American Moor is not Mr. Cobb's first play, but it is the one that is most timely, most truthful, and the one for which he is most suited to perform, for it is a vision of race in America with the entertainment industry as microcosm. And he is now able to reflect upon a lifetime in that industry where no one who was anything like him ever wrote the rules. American Moor is his song to the unheard, unseen other. To minimize empty seats, we are issuing more tickets than available seats.